I awoke this morning to a very damp and cold tent and gear. I was camped in a bit of a canyon and everything was wet from the rain last night, so there was no avoiding it. I packed everything up(knowing I’d be laying it all out to dry later in the day) and started hiking at 7am. It was in the upper 30s and I hiked as fast as I could knowing the trail was headed up out of the trees and into the sun. The road I was hiking on was an old closed forest road and it had overgrown wet weeds and grass, so my pant legs were cold and wet. Also, I had to put on my cold and wet shoes and socks from yesterday knowing they were going to get soaked hiking anyway. I am getting my final pair of shoes in Butte and can tell I need them! My feet are just sore and with the cold this morning, I felt the deep cold ache in every joint of every toe. 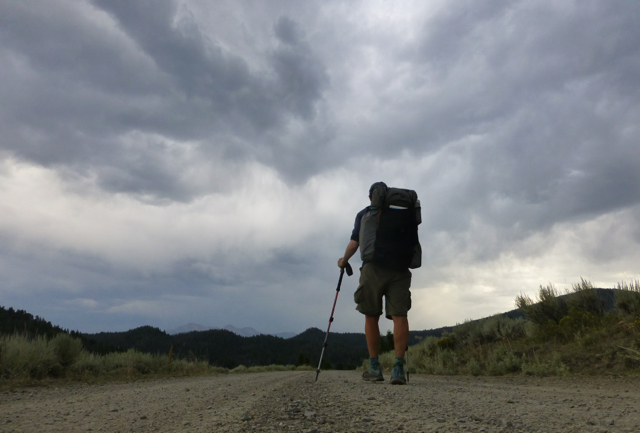 Fortunately, the discomfort only lasted about and hour and then I was warmed up…not dry, but warm. I was dry another hour later…but my feet weren’t dry until lunch when I was able to lay my shoes in the sun. 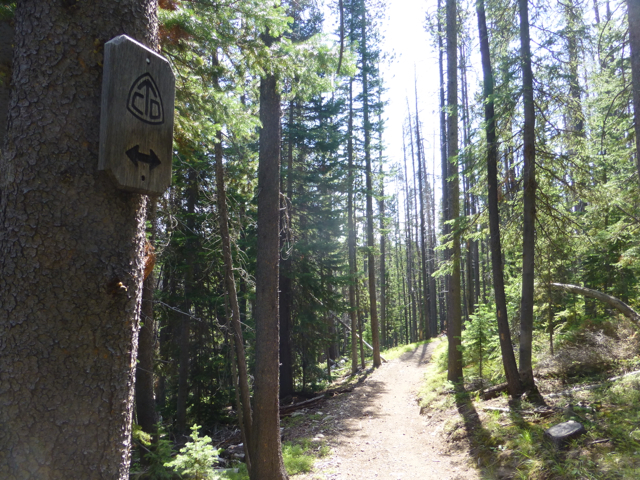 The hiking this morning kept me distracted as there were a lot of frequent turns at random places as the trail wove through the forest. Once again, I was so glad to have a GPS for this. 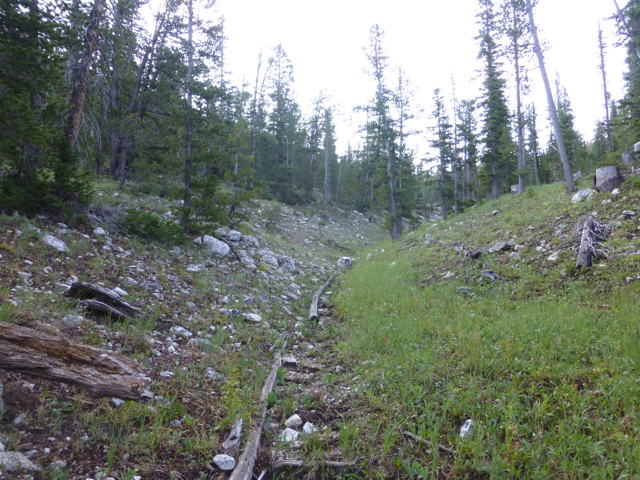 I think my favorite instruction this morning was, “Follow Stream Bed Up.” I was walking on the overgrown old road and on my right was a dried up stream bed…Only on the CDT! This is what I hiked up. Soon after that, I hit a point where the trail was very faint in the forest and almost nonexistent. There were animal trails everywhere too and it was difficult to differentiate between the two. It was like a riddle and I realized that there were two indicators that I was on trail. Cut branches on trees from time to time and markings in the bark every so often. It was like the person who made the trail decided to just walk through the forest and cut random branches out of the way and then scrape the tree bark instead of putting up a trail sign. Probably the most cost effective way for now since the trail doesn’t have a ton of money for maintenance. 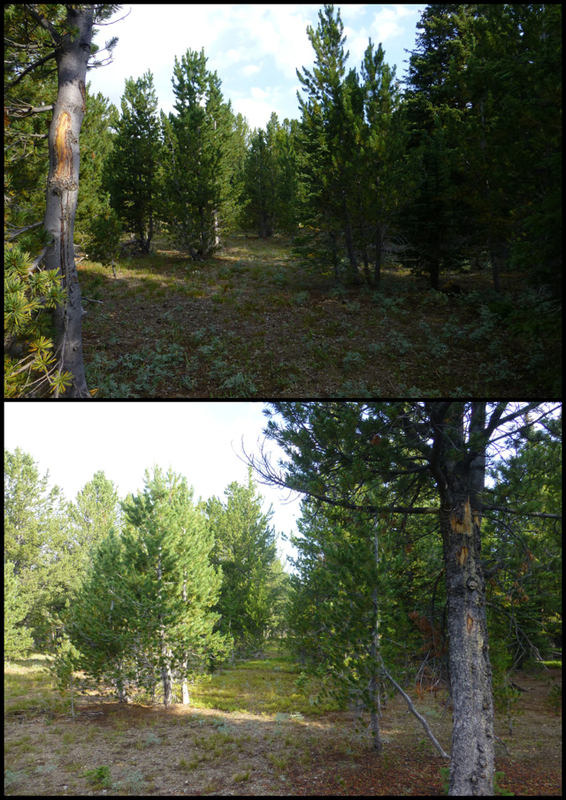 You can see the markings faintly on the front most tree in each picture. By late morning, I was on actual trail and then forest roads. There was more signage, but still lots of turns and intersections. I finally got service and was able to get the last four days of blogs posted. It was an extra pause in hiking for a good 20mins, but worth it. 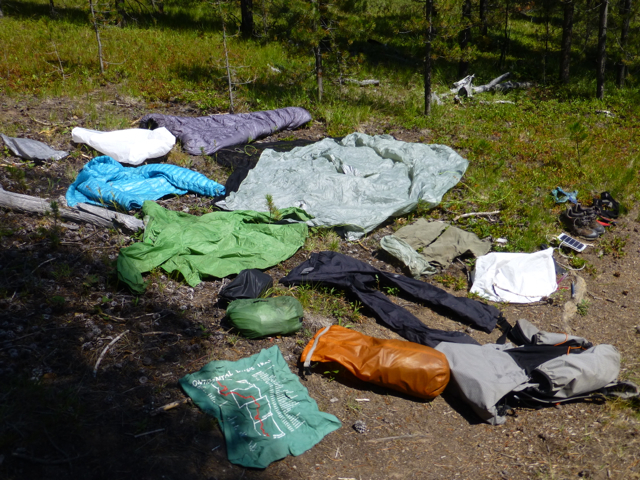 I also had an extended lunch because I had to take out practically all my gear and dry it. I am always annoyed when I have to do this during lunch because I don’t get a break as I’m unpacking and repacking everything while I eat. I reached the first possible hitch to Butte, which is I-15 at 4:30pm. It is 27mi to the next possible hitch. It was tempting to go to town as the clouds were looking more threatening. I decided to go on ahead and hike to the next road. I have enough food and that hitch looked like it might take awhile. My hope is to get to the next exit point around 1pm tomorrow, so I’ll get a longer nero before my zero (if that makes sense). I also wanted to just get these miles done and shorten the next leg so I’ll have less to carry out when I leave Butte. Today was my first whole day to myself in awhile and I really enjoyed it. I know some of you are worried about the solo hiking(mom). Also, I know that it’s fun to see other hikers on the blog, but I really enjoy doing it all on my own from time to time. There is a great sense of accomplishment and pride that I get in doing days on my own. Especially days like today which had a lot of route finding. I doubt I’ll be solo the rest of the hike as I’ve come in and out of various groups and people along the whole trail. If I do end up going solo to the end, I’m okay with that too. I know what I signed up for. 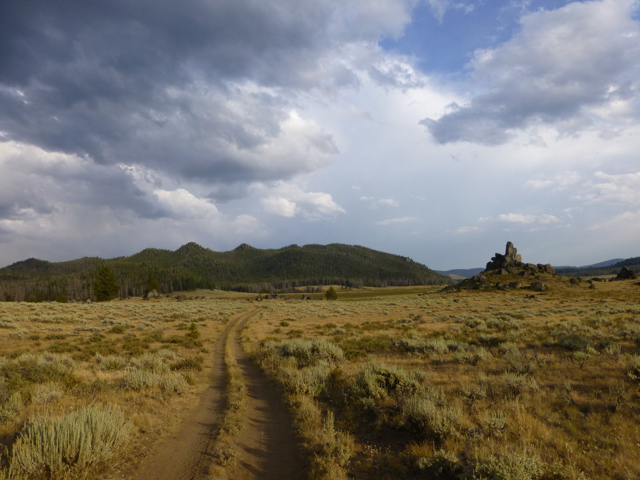 I’ve always had Butte in my mind as a defining moment on the trail. After Butte, I will only have three resupplies left and 479mi to CANADA. I know that seems like a lot, but for me it feels like the homestretch. These last two days are the first days that I’ve actually gotten emotional when I think about finishing. I feel like it’s really happening. I’m definitely ready to finish and have been thinking a lot of post trail life for awhile now. I’m ready to go home and watch tv. I still want to take the time to appreciate these last legs and be present cause I know I’ll miss it greatly once I’m back to my normal grind. I’m especially looking forward to ending in Glacier. My body feels strong and energized, so that’s really good. If you can’t tell, I’m hiking on a road and typing this…and rambling cause I can, ha! As for the rest of the night, the clouds did look threatening and they rumbled a bit as I could see rain coming down all around me. I figured it was inevitable that I’d be rained on for the fifth day in a row. I was trying to make it to a water source to get water for camp and cooking Mac & Cheese (one of my favs!). When I got there, it was completely dry. Argh! That figures. No rain today, but to balance the universe, I get no water. That’s the second source today that was dry. It’s frustrating to be part of the first NOBOs coming through because we don’t have anyone to warn us about these dry sources. I’ll be posting a report on this leg for the rest of the NOBOs on our class Facebook page to spread the word. The next source was 4mi away and that was too far for tonight, so I accepted that for the first time this hike I’d be eating a no cook dinner. It is fortunate that I always carry extra water, so I have enough until tomorrow, but just not enough to cook with. I ended up having bars, string cheese, a tuna packet, some Pringles, and a Snickers. Pretty much an on trail hiker buffet. I’m getting real food in town tomorrow for sure! I hiked a bit further since I didn’t need time to cook and the forest got thicker with large stone boulders that are cool. I’m about 17mi from the road to town, so I’m looking forward to an early start tomorrow so I can indulge with a nero and a zero!